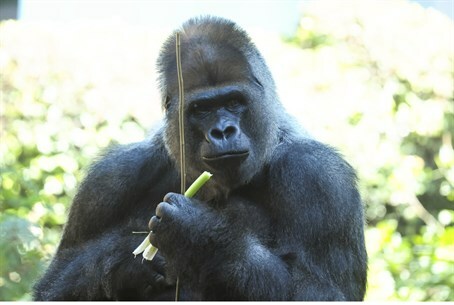 Unlucky staff member hospitalized in serious condition after being mistaken for a gorilla during an emergency drill. "That guy looks nothing like me...!" A man was left in serious condition at a Spanish zoo Wednesday when he was shot with a powerful tranquilizer dart - after being mistaken for an escaped gorilla. According to La Opinion de Tenerife, the drama began when a panic-stricken visitor to Loro Park zoo in the resort island of Tenerife reported seeing a giant gorilla running around the adjoining theme park, after presumably escaping from its pen. Zookeepers were immediately scrambled to track down the beast, which they duly did - felling it with a powerful tranquilizer dart to the leg containing enough sedative to knock out a hefty 200kg primate. However, upon closer inspection it was revealed that the "gorilla" was in fact a member of staff, who had dressed up as a giant ape as part of a drill testing the zoo's emergency routines. The horrified vet who shot him - and who had only been working at the zoo for two months - immediately called emergency services, who evacuated the 35-year-old "gorilla" to the nearby University Hospital. He was said to be in a serious but stable condition, after suffering an allergic reaction to the tranquilizer, but doctors say he should make a full recovery.